After a nice trip down to London to go and see my family, I had the joy of 4 hours of train travel! That to me seems like the ideal time to program compared to waiting doing absolutely nothing. 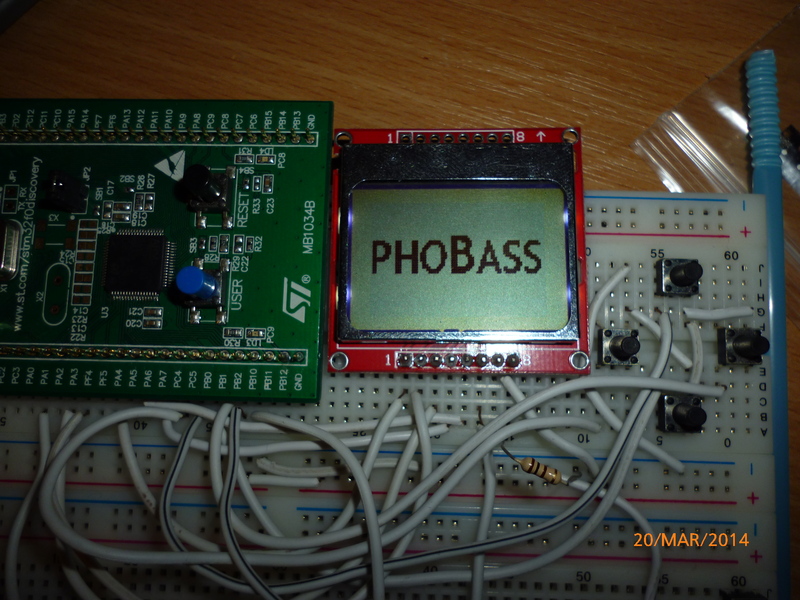 I brought along my breadboard with my LCD and STM32F0 discovery to test my programming though to the untrained eye, its quite likely that it could look like some form of bomb threat! Back to more important business though, All of the menu’s are now completed along with the logo display screen coming on well. Talking of logos, I’ve been quizzing my close friends and acquaintances on which logo to choose though the results are pretty inconclusive with 4 of the 7 I designed drawing for first place. I was falling asleep the other night when it occurred to me that I really would like to potentially take the Phobass forward as a legitimate business design. I really enjoyed having and learnt a lot with my investors for the short period we were together but I think that it was a touch rushed and would’ve much preferred the time to fully develop the Phobass first. My idea of a completed product is one where a firmware update post sale isn’t needed, for example: you don’t need to plug a USB cable into your dishwasher, microwave or television to update the firmware so why should one have to plug in a musical instrument to update it? As I may have mentioned in a previous post, I’ve decided to go for a full on stand alone synthesizer this time round, with less dependency on using a computer to create patches. If I decide to still include an SD card (debatable as all patches could be stored in STM32XXX flash), I will also develop a computer based program to edit patches but I’m not 100% sure on this. I’m also wondering at what number I should limit some of the musical parameters too. I’m currently thinking 0-999!